It’s a simple question with a lot of implications. After your tandem skydive, you learned that the next step was to become certified to skydive solo with the Accelerated Freefall Method. Ask any experienced skydiver around, one of the most critical times in your skydiving career is right after you receive that hallowed A License. After getting your license, you might be wondering, “now, what’s next?” Well dear (soon-to-be) friend, here’s some advice on how to keep moving forward in the sport for a seamless transition from student to experienced jumper. Stoke the Fire with Friends! 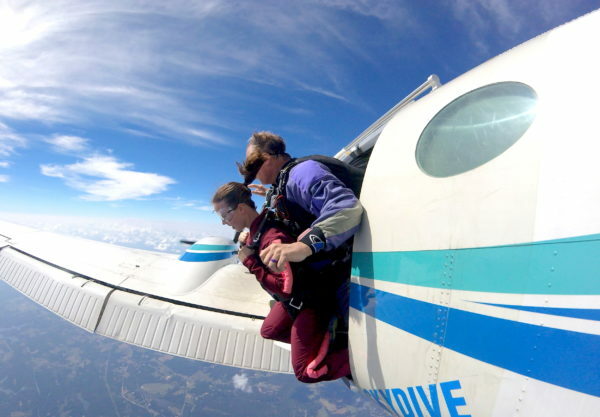 For jumpers across the board, one of the most powerful incentives to keep skydiving is to have someone to skydive with. Keep that fire burning by surrounding yourself with passionate skydivers! The world outside of the drop zone might not understand, but the folks you banded together with during your program progression will prove to be tried and true. After all, there is no one who quite understands where you’re at, or is as pumped to skydive, as a fellow newly licensed jumper. If you can, stay in touch with the jumpers you’ve met and gone through AFF with, and as they become licensed, plan out days to jump together. Intentions are powerful! How do you stay motivated to progress in the sport? Easy. Set goals for yourself. The goals can be as simple or as grand as you like. But if you’re really trying to get the ball rolling, we advise beginning small to build momentum off of your successes. During your skydiving progression you can set several goals: to fly relative in small groups, to complete at least 8 points on a skydive, to earn your B license or C license, to learn to fly a wingsuit, to join a team and compete at nationals. Maybe even set your sights on making a record skydive or getting a skydiving rating to give back and teach others to skydive! No matter what it is just get moving! Those goals aren’t going to achieve themselves. Skydive Monroe is full of positive mentors and skydiving leaders more than happy to take you under their wing. In the air and on the ground, these guys and gals, have a wealth of information to offer. Receiving coaching helps you to level up your skydiving skills and help keeps burnout at bay! You didn’t think the learning stopped just ‘cause you got your A License did you? No matter your level, skydiving skills can always be improved. Attend a canopy course or take a skills camp. Stay actively involved in accruing as much knowledge as you can. The benefit of continued skydiving education isn’t just the knowledge you gain, it’s also the connections you make! Attending courses and camps is the best way to get connected to the legends and emerging talent in the industry. The heroes you follow on social media are real people: learn from them! Here’s a secret about becoming a great skydiver: consistency is key, as in consistently show up! Don’t be a stranger. Try to commit to visiting the dropzone once a week, even if the weather looks a little iffy. Trust us, you can learn plenty and make important connections even if you’re grounded.